"Geological Map of the Tejon Pass & Cañada de las Uvas and the Vicinity. Including the Pass of San Francisquito & Williamsons Pass." Printed in 1856 as part of the "Reports of Explorations and Surveys, to Ascertain the Most Practicable and Economical Route for a Railroad from the Mississippi River to the Pacific Ocean, Made under the Direction of the Secretary of War, in 1853-54, According to Acts of Congress of March 3, 1853, May 31, 1854, and August 5, 1854. Volume 5. Washington: A.O.P. Nicholson, Printer, 1856." House of Representatives: Thirty-Third Congress, 2nd Session, Ex. Doc. No. 91. The map shows information derived from John C. Frémont's expedition of 1844, under President John Tyler, and of Lt. R.S. Williamson, of the Corps of Topographical Engineers (later called the Army Corps of Engineers), under the direction of newly appointed War Secretary Jefferson Davis. 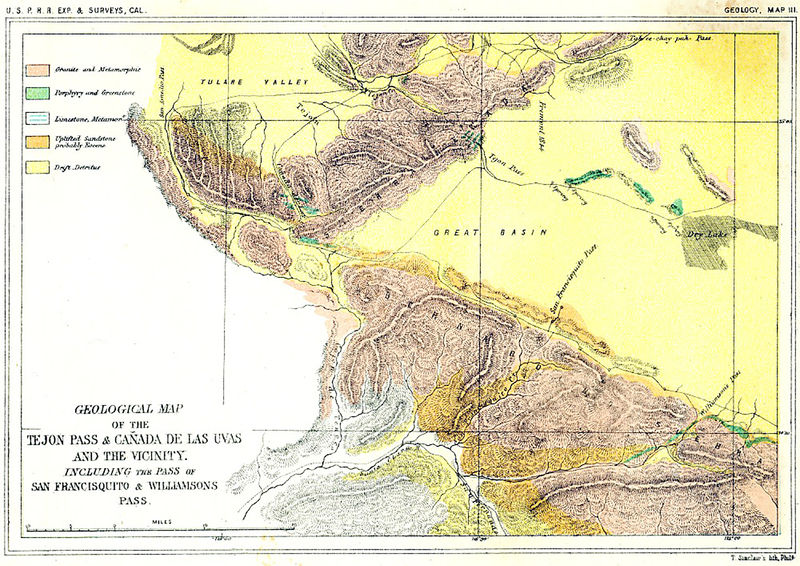 Of note: Cañada de las Uvas, above center to the west, is Grapevine Pass (Uvas=grapes). At top, east, is "Tah-ee-chay-pay Pass," aka Tehachapi. Below center, west, Cajon de Tenoco is Piru Creek. Williamson's Pass, named by him in 1853, is at the head of Soledad Canyon, where it feeds into the Mojave Desert. This is probably where one of the Jayhawkers, William Robinson, died a few years earlier, as detailed in The Forty-Niners in Death Valley: A Tentative Census. Williamson also named the "New Pass" on his 1853 expedition (later called the Newhall Pass), and while in Soledad Canyon, he identified the unarmored threespine stickleback fish as a separate species  thus its scientific name, Gasterosteus aculeatus williamsoni. Key to map: As shown, pink represents "Granite and Metamorphic." Blue-green is "Porphyry and Greenstone." Striped blue-green is "Limestone, Metamor(phi)c." Orange is "Uplifted Sandstone probably Eocene." Yellow is "Drift Detritus." By T. Sinclair's lith(ography), Phila(delphia). IN THE HOUSE OF REPRESENTATIVESFebruary 14, 1855. Resolved, that there be printed, for the use of the House, ten thousand copies of the reports of surveys for a railroad to the Pacific, made under the diretion of the Secretary of War, embracing the report of F.W. Lander, civil engineer, of a survey of a railroad route from Puget's Sound, by Fort Hall and the Great Salt lake, to the Mississippi river; and the report of J.C. Frémont, of a route for a railroad from the head-waters of the Arkansas river into the State of California; together with the maps and plates accompanying each of said reports necessary to illustrate them. Clerk of the House of Representatives of the United States. THIRTY-SECOND CONGRESS, SECOND SESSIONChapter 98. Sect. 10. And be it further enacted, That the Secretary of War be, and he is hereby authorized, under the diretion of the President of the United States, to employ such portion of the Corps of Topographical Engineers, and such other persons as he may deem necessary, to make such explorations and surveys as he may deem advisable, to ascertain the most practicable and economical route for a railroad from the Mississippi river to the Pacific ocean, and that the sum of one hundred and fifty thousand dollars, or so much thereof as may be necessary, be, and the same is hereby, appropriated out of any money in the treasury not otherwise appropriated, to defray the expense of such explorations and surveys. THIRTY-THIRD CONGRESS, FIRST SESSIONChapter 60. Appropriation: For deficiencies for the railroad surveys between the Mississippi river and the Pacific ocean, forty thousand dollars. THIRTY-THIRD CONGRESS, SECOND SESSIONChapter 267. Appropriation: For continuing the explorations and surveys to ascertain the best route for a railway to the Pacific, and for completing the reports of surveys already made, the sum of one hundred and fifty thousand dollars. LW2143a: 1200 dpi jpeg from original map.